This is another piece from my first website. It was last updated in the year 2000 – I have added one sentence at the end this time. I suppose it’s a bit like windmills, steam trains etc. I’ve always liked mechanical things that are relatively easy to understand. Clocks fall in to that category. Actually, I can quite like quartz clocks, too, but clockwork is best. Back in the 1960’s I inherited my grandfather’s long service clock, which he was awarded for 45 years service on the railway. 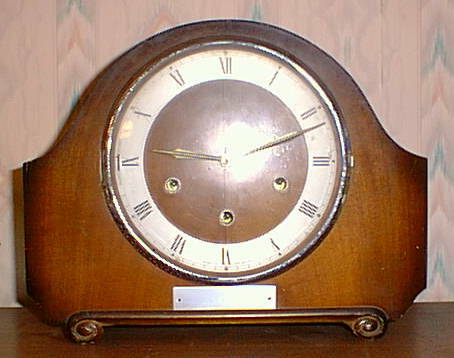 It is not very special – just a Smith’s mantle clock with Westminster Chime and 8 day movement. I’d hoped to get his pocket watch, but that went to a cousin. With the coming of very cheap and totally accurate quartz clocks, Grandad’s timepiece fell into disuse. When I decided to get it going again, it wouldn’t work. By then, my clock maintenance skills were well honed and it has now run reliably for a couple of years. My next clock is another 8 day one, this time a striking wall clock. This belonged to my step mother’s family. It came to her house when her dad died but neither my dad, nor my half brother could get it to work and they were going to put it on the scrap heap. They gave it to me instead and it has been working well for a couple of years. I can’t find a maker’s name anywhere. The art work on the case is by Peter Garforth. That’s my step mother’s dad. He was quite a successful artist. ‘Old Garforth’ – my step mother’s father had and painted this clock. Next is my postman’s clock. This is a 30 hour, weight driven clock with an alarm that could awaken a postman. 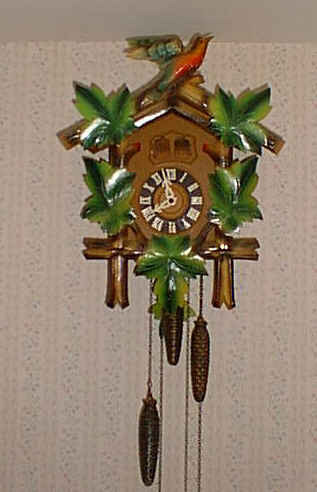 I have searched for information about this clock – its origins and how it came to be in my family, but somewhat in vain. I believe my father bought it in the early 1950s. 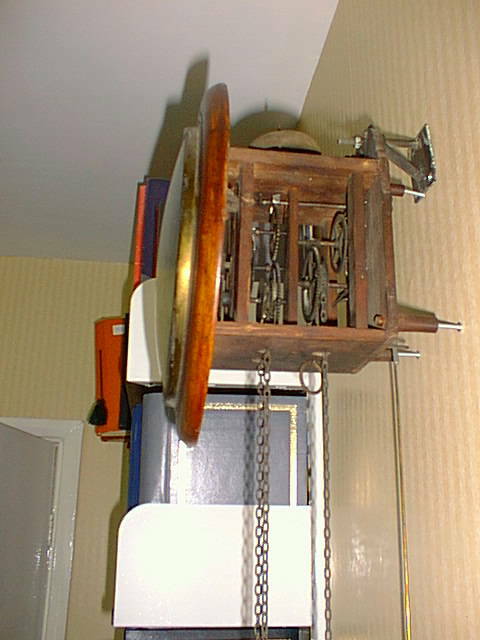 His aunt had a similar looking clock which is still a family piece, so he felt capable of fabricating the weights and pendulum. He must have paid as near to nothing as possible for it. Postman’s clocks were made in the nineteenth century in both America and The Black Forest. Black Forest ones are a bit classy and can be ornate. As a clock shop man in Wells, Somerset put it to me in July 1999, American clocks were very crude. Mine is undoubtedly very crude so I think it is American. I can’t find any makers marks. Posty has an alarm that would surely have woken a neighbourhood – not just the postman. My Dad had this clock for years but it fell out of use and was just kept up as an ornament. This also applied to his aunt’s similar clock. After his death, his widow gave me the postman’s clock and I found some gentle work with meths and clock oil was all it needed to get it to work. Like the others, it has been going steadily for a couple of years now, although I find it hard to keep it regulated. I then got my step mother’s clock – ex great aunt’s working, too. Posty’s works with the bell on top. I have seen a similar clock in a folk life museum in Selkirk, Scotland. They didn’t know anything about it. I have also seen a postman’s clock on sale in a clock shop in Wells, Somerset. This Black Forest model had an ornate face which, to my eye, made it less attractive. If anybody can help me to identify likely age and maker I’d be interested to hear. Don’t worry about the value. It is next to nothing! In December 1999 I acquired a cuckoo clock from a local Christmas bazaar. I was told it didn’t work well and as a result I paid just £3 for it. To be honest, I think it is rather over the top in style, but I relished the challenge of getting the thing going. I was rather disappointed here, for it took virtually no time to straighten a link wire, to make the bird do a full cuckoo and to lightly oil some works so that it would keep running. My surprise came when I hung the clock and attached weights. I had wondered about the second door which contained what I called a cheese man. In fact, as this door opens, every half hour, a music box plays. Here is a photo of this clock. Cuckoo is the only old clock I have bought. All the others I have belonged to members of the family. Since this was last updated in the year 2000, I have acquired more family clocks and some ment5ioned here have failed. I must get round to them again. More from that Pul/Pan Farewell Tour. I thought I could add some more on this tour, having located notes and photos. It seems we had a bad start to the journey with a half hour signal stop. Engineering works had closed one of the down lines and a train break down caused problems for another. The non stop from Brighton to Victoria took us more like an hour than 50 minutes, although I’m sure a 50 minute journey was planned. My photos were taken on a blue metallic box camera. It used 120 sized roll film and took 12 square images on a film. These I contact printed. So, they suffer from many handicaps. One is that I was young and didn’t compose decent photos. But for what they are worth, here they are – from 24th April 1966. 3041 at Ore on the same Pul/Pan tour. We passengers all had to disembark whilst the unit shunted to the down platform. At Brighton with my friends Bob and Nick. 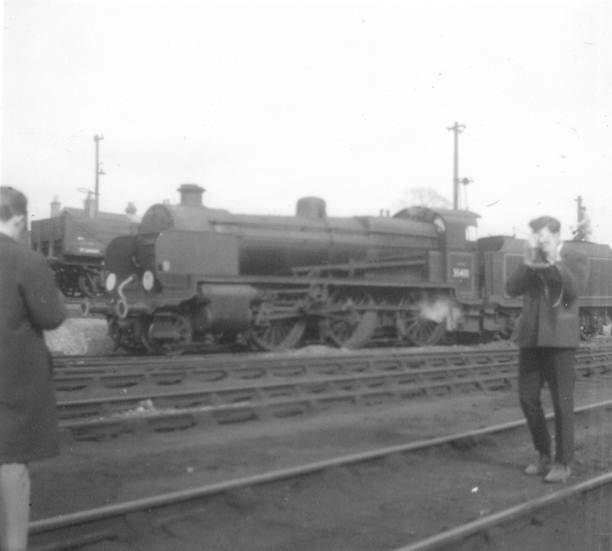 The Wilts and Hants Rail Tour – 3rd April 1966 was organised by The Locomotive Club of Great Britain. It was by far the biggest and most expensive tour I ever went on. Previously, I had confined my attention to Kent, Surrey and Sussex. This one was off to far distant places and it was taking some strange routes – a route given on the ticket. We did a very twisted route from Waterloo, through the South London Suburbs to reach Norward Junction and then East Croydon. We turned right at Redhill and went out to distant Basingstoke in Hampshire via Reading in Berkshire. Then we took the Main line down to Salisbury in Wiltshire with a stop long enough for nerds, young and old, to visit the engine shed. Next we made it down to Southampton and then we had a run ‘Over the Alps’ to Alton on what now includes the Watercress Line. From there we zapped it back to Waterloo. Well actually, we probably didn’t do too much zapping for the motive power for the 10 coach train was odd – no doubt what was available in the final run down of steam – and from my viewpoint it had the benefit of being all ex Southern Railway stuff. 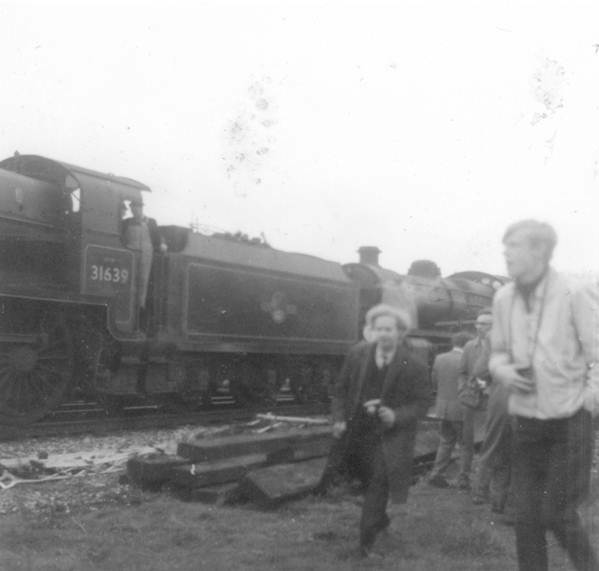 In fact our mixed traffic N class 2-6-0 tender engine, 31411, might have dated back to pre Southern Railway days for the first of the class was introduced in 1917 She went as far as Salisbury, partnered with similar looking U class number 31639. 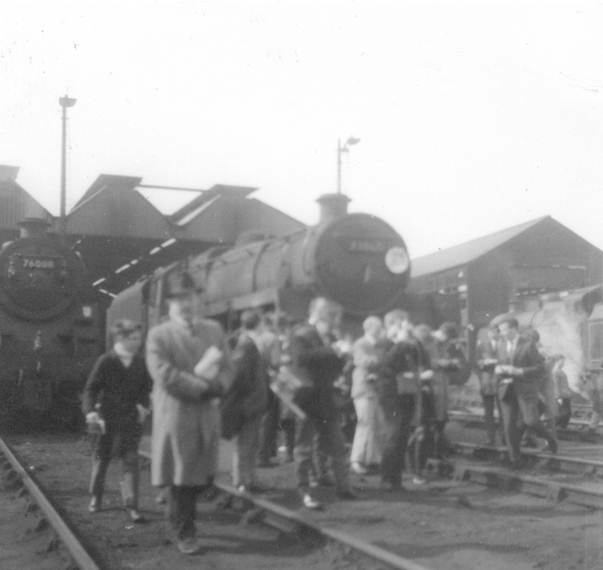 The return journey had the U class with Bullieds, Q1 0-6-0 tender engine 33006. These unlikely 2nd world war built engines were hugely successful and we Southern enthusiasts loved the strange shape of them. I can show some photos taken on my very low quality metal box camera. I used 120 film and processed my own doing contact prints. Scanning them, at 600 dots per inch shows me just how poor they were, but they are my memories. That’s my pal Nick leaning out of a window. I don’t know what the station is behind him. I’m still in touch with Nick who is a judge these days. This is at Wanborough, between Guildford and Aldershot. It must have been a photo stop on a quiet bit of line. I took quite a few photos at Salisbury shed. There are a couple of standards here and a man who looks horribly like Dr Beeching. Surely not! That was our N class – 31411. And our U – 31639. She’s having a smokebox clear out. 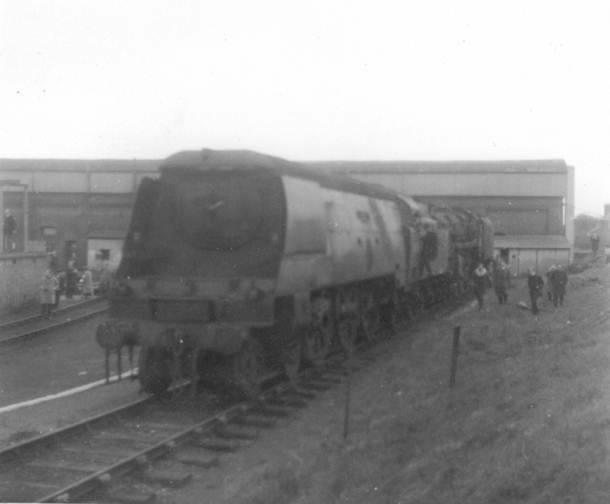 The Bullied Pacific at Salisbury was out of service – no name, no number! I don’t think it has a con-rod either. We had a photo stop at Romsey. That sums up rail tour life. All men or boys, dashing everywhere. I remember little of the journey up to Waterloo but I daresay our double headed train made light work of the Mid Hants line. Looking at the times kept on the http://www.sixbellsjunction.co.uk/ site, it looks to have run generally a bit ahead of schedule, and certainly was able to make up lost time. My earlier writing, on travel in Ifield, was written in 1992. Now, on 26th February 1997 (updated July 99), I wish to add a little more about the changes wrought to the railways in my lifetime. I do this as a one time avid train spotter, so I will include a little about the nature of that beast, and a continuing enthusiast for railways and their engineering. When I was born, in 1948, I was only months younger than the new British Railways. 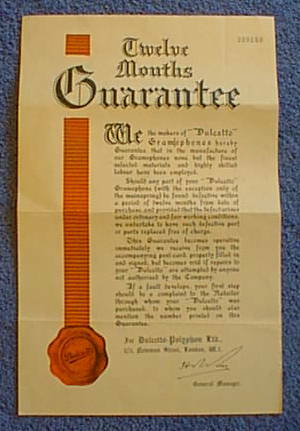 The original private companies, who built and maintained routes and ran the services on them had been grouped, by government decree into four big companies after world war one. After world war 2, the new government favoured state ownership and control so the four large profit seeking railways were united into the one, nationalised concern, dedicated to running a modern, efficient service for the public. It came into being as clocks struck midnight at the end of the coal starved and chill year of 1947. I suppose that in my early life, British Railways were searching for what we would now call a corporate identity. I have no memory of the search for a new livery for trains or of interchange trials between locomotives of the erstwhile rival companies. My earliest memories are confined to the Southern Region and this is hardly surprising for, with the exception of one trip to Southend, and that by car, I never left the confines of Kent, Surrey, Sussex and Hampshire until the early 60s. The Southern was a very autonomous area and always maintained something of a separate identity anyway. So my earliest memories of trains are of electric traction. The main passenger services through my part of the world were all electric. The green carriages, of wooden construction, plied their quiet way through the equally green and quiet countryside. I expected trains to be compartment coaches and I thought those with a side corridor were rather swish. A distinctive feature, for me, of the electric trains was the noise of the pump which maintained the air brake pressure. I imagine that the motor activated automatically if the pressure got too low. This often happened after a stop so the motor cut in whilst the train was standing at stations. A rather mellifluous ‘aning aning aning’ sound drifted up from under the floor of the train. This was a noise I liked. There was a long standing tradition that coaches on the Southern should do their 30 year stint and then be entirely re-built so that they could do another 30. As a result of this, many of the electrics were composed of old steam hauled coaches which had undergone quite radical conversion. I never expected the riding quality of a train to be very good, but the rather soft cushioned seats, even in third class, provided for a comfortable if rolling journey. This still continues. I noted the other day (now July 99) that refurbished 4 CEP units are still running and they were built 40 years ago. 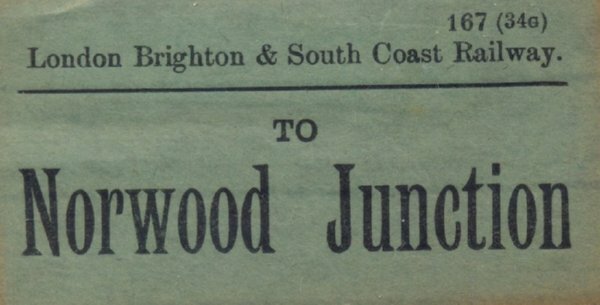 All of the trains on the Brighton Line had been built for electrification in 1933. They were thus at least 20 years old in my earliest memories. Even on the express stock, the body work was all wood and the bogie design, by present standards, extremely poor. This was particularly the case in the coaches that carried the traction equipment and I noted that my father always avoided these coaches when we travelled on them. At the time, I thought he preferred compartments, for the motor coaches on the Brighton and Hastings expresses were open saloons. As a teenager, I learned to pick these coaches out so that I could feel the amazing ‘hunting’ movement as the wheels ploughed their straight path up the track and the body rocked and rolled from side to side. When my grandparents lived in Tunbridge Wells, we visited them by taking the cross country, and un-electrified route from Three Bridges, via East Grinstead. This brought me into contact with that evil, hissing monster, the steam engine. I recall being utterly terrified of these beasts which were noisy and hissed and spewed steam from orifices here, there and everywhere. The coaches pulled by these trains were, to me, archaic. Many (All?) dated back to pre 1923 days and had some strange designs of interiors. One coach had a sort of box room with seats all round it, except for the door. 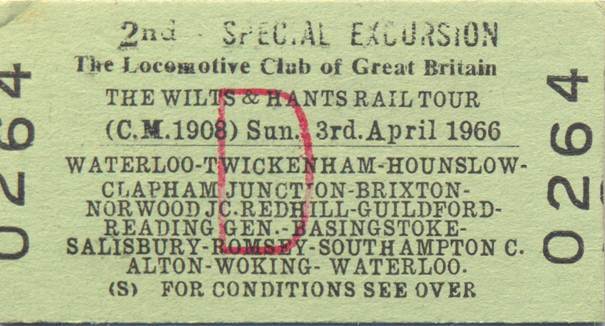 These days it might have commanded a premium ticket price as a sort of club class coach. Then, it was really a place to avoid because a compartment kept us, as a family, away from others. I have a vague memory of bird cages appearing on some trains. The bird cage that I refer to was, in fact, a raised section of roof with windows in it. This enabled a guard to look out over his train to make sure all was well. (The electric guards had periscopes to perform this function.) Other coaches had little bay windows – a little head sized box on the side of the carriage. Again, the guard could use this to look over all of his train to make sure that no coaches had got lost. The engine was almost invariably a 0-4-4 tank dating back to Victorian or Edwardian times. These had migrated to Sussex from other parts of the Southern network and, on this line, they seemed to be preferred to the locally made 0-6-2 tanks. 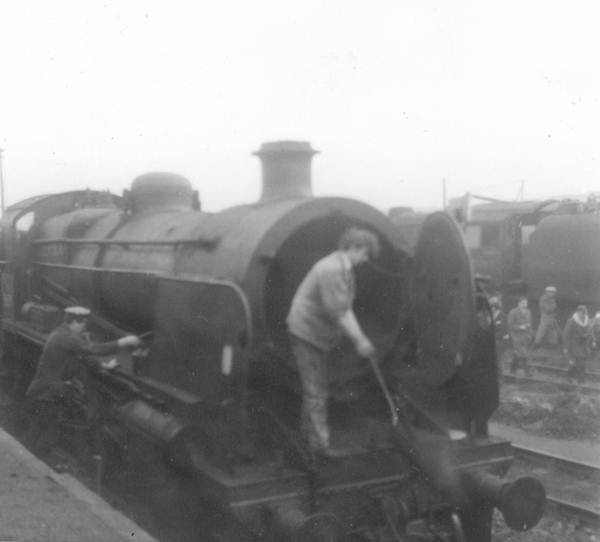 The trains were equipped for push and pull work. This meant that a series of rods and cables ran under the coaches from the engine to a drivers compartment at the rear of the train. There was thus no need to move the engine at the end of the line. The driver went to the cab in the coach and could operate from there. All steam trains had a crew of three. 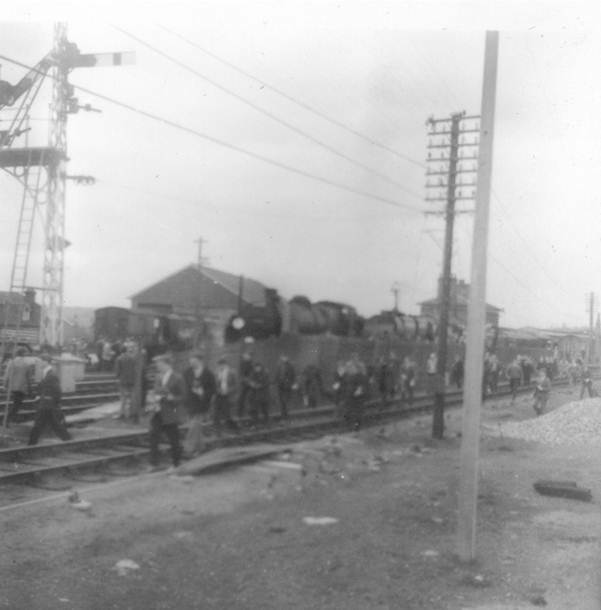 The driver was responsible for the locomotive work. The fireman shovelled coal and generally ensured that fire and water levels were OK. The guard was responsible for the carriages and passengers. On a push pull train, at times, all three of them were in different places. In my memory, the steam service on the East Grinstead line, or Three Bridges Flyer as we called it, worked an interval service. You could be sure that at 6 minutes past the hour, a wheezing tank, with two green coaches behind would slowly pull out of platform 6 at Three Bridges and turn sharp left (East) for Rowfant and Grange Road, before the market town of East Grinstead. 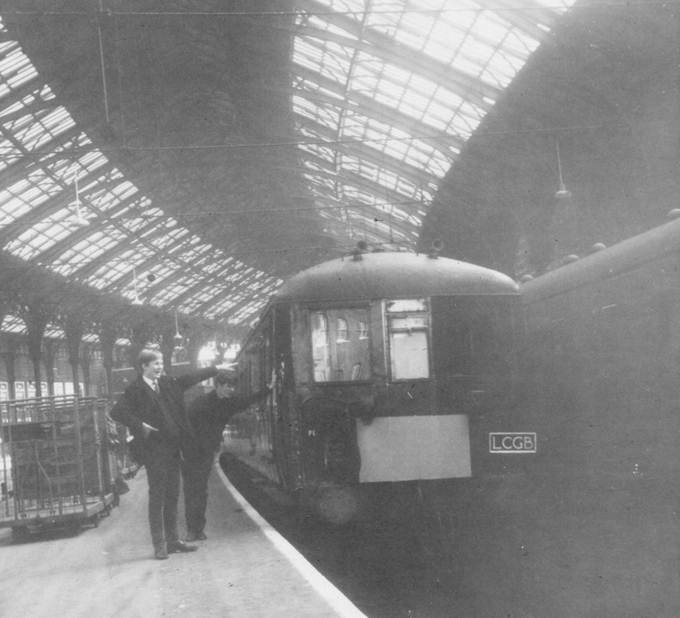 The Southern had clearly believed in the interval service for all of the lines worked to a fixed schedule of services with extra trains added during rush hours. If, in 1960, I stood on Three Bridges station I could guarantee to see a large number of trains in each hour. Apart from the flyer for East Grinstead, there were two stoppers from London to Brighton (one from Victoria with headcode 14 and the other from London Bridge carrying 15. 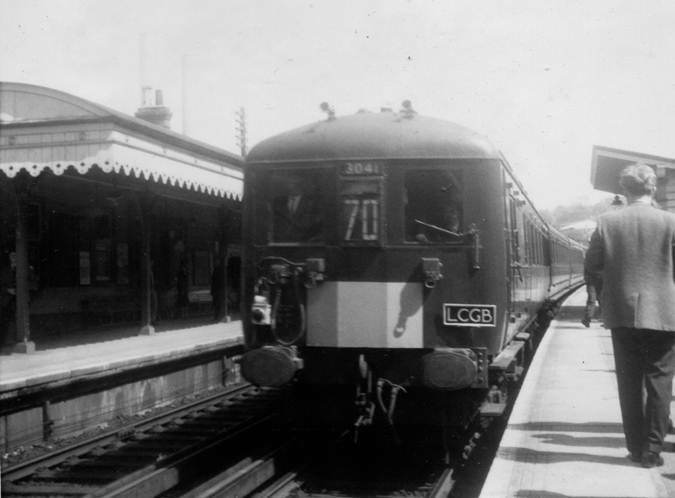 There was also the better service from London, calling only at main stations to Three Bridges before becoming the stopper down through Crawley and Horsham to Littlehampton and Bognor. These were service 42 (Southbound) or 98 towards London. The even number told you that it worked in and out of Victoria. Odd numbers were for London Bridge. These services had two variants North of Three Bridges. One each hour went via Redhill, whilst the other missed it by using the quarry line. The quarry line trains used headcode 96. Another 5 trains each way raced through Three Bridges in each hour. These were service 4, non-stop from London to Brighton and services 5 and 6 which were semi-fast London to Brighton trains. Service 16 used the Cliftonville curve to avoid Brighton and provide a direct service to London from Hove, Worthing and Littlehampton, whilst my favourite, service 52, curved away to the East at Keymer, South of Haywards Heath heading for Lewes, Eastbourne and Hastings. Twenty certain train movements per hour formed an excellent basis for train spotting, but on top of that there were freight movements, for Three Bridges boasted a large engineers yard plus extra trains like Newhaven boat services and the Birkenhead train. Perhaps it was no wonder that I overcame my early fear of the steam train to become an avid spotter. Some ten miles North of Crawley was Redhill. This was clearly a railway centre of some importance not least because the mails were loaded and unloaded here. It also featured junctions for Tonbridge and Reigate and Guilford. 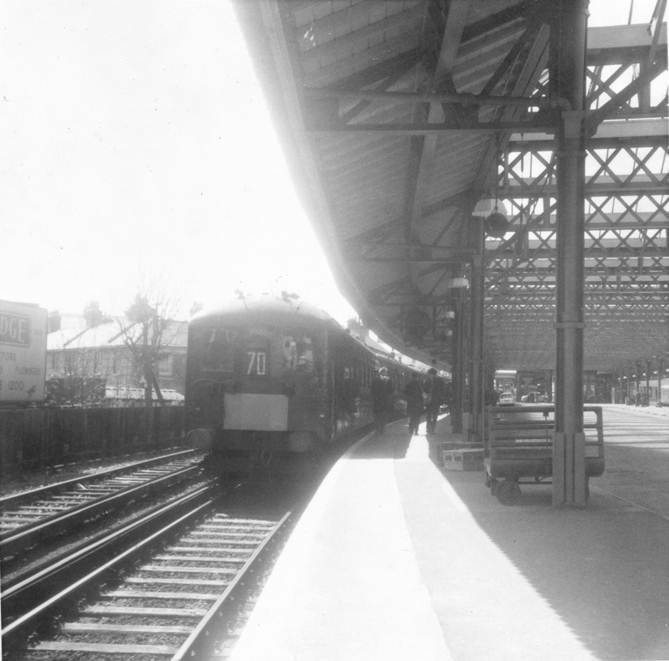 Trains, like the Birkenhead, which arrived off the Guildford line, had to swap engines since the onward journey to Hastings involved a reverse at Redhill. From my earliest days we visited Redhill since my other grandparents lived at Tonbridge. I was always aware that things were different at Redhill. It was here that one saw coaches in the blood and custard livery that British Railways used. The steam engines used on Tonbridge trains were bigger than those on the local line at Three Bridges. They probably pottered at similar speeds but the whole air was much more of a main line. I remember that it was on these trains, that my father pointed out to me that the railways had a new logo – still searching for that corporate identity, and it was also on this line that it was pointed out to me that third class had been abolished. This made no difference, since only first and third class had been in use, certainly in our area. Now the transfers and paint had to be changed to say 2nd instead of 3rd. What I didn’t realise until later was that Redhill was different historically. Prior to 1923 it was one of those places where the London, Brighton and South Coast Railway had fought the South Eastern and Chatham lines. Although ownership had changed, old ways lingered on. 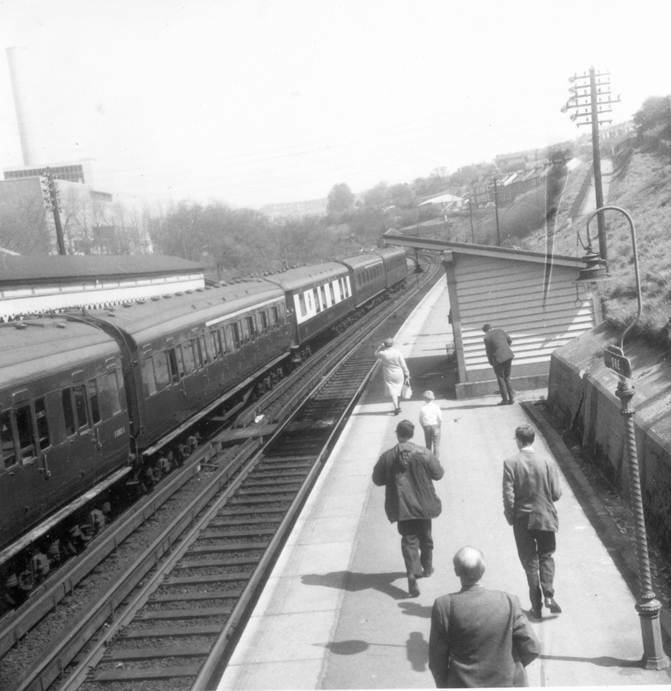 The Tonbridge line had been the original main line to Dover so it was no wonder I thought it had that air of importance. Tonbridge to Redhill and on to Guildford was not only old South Eastern territory, it also did and still does serve as something of a major through route. I now realise that it would have been amazing if the station did not seem different and important. Pre 1959, my railway experience was of journeys on the Southern system. If led by my father, such journeys were ‘explained’ so I learned about signals, third rails, pumps for brake pressure, points, crossovers, special operations and tokens for single line working. In fact, my father was an enthusiast and he knew what he was talking about. 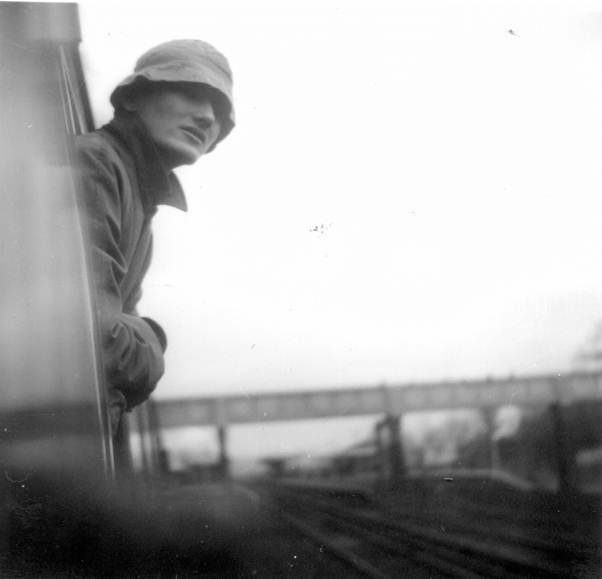 And then, in 1959 I became a train spotter. In the 1990s, to describe someone as a train spotter is a term of abuse. Train spotters are supposed to wear anoraks (and I did). As a result, the ultimate insult is to describe someone as an anorak. Other phrases that might be used to describe train spotters include nerd, although that may include a bit of brain power or they might be told to ‘get a life’. As of 1997, I take extreme offence at these phrases. At the age of ten and eleven, I started to gain knowledge in a particular area. Of course, I can see the absurdity in the main activity, the collecting of train and engine numbers. Why did I have a need to see each and every example of the 4 Lav class of train. After all, each and every one of the 35 of them looked identical (with the exception of 2926 which had a different motor coach and numbers 2954 and 55 which were more modern variants) I can’t explain why but at least I can vouch for memory since I only looked up those unit numbers to check, and I was right some 30 odd years after they were all scrapped. Yet that was the aim of the train spotter – to see every example of a type of locomotive or train. And that is just what I did with the Southern Electrics I saw each and every train that was running in 1960. It took me about 8 years to complete the lot and by then, new ones had been built and I never got involved in collecting them. It was a social life. Groups of like minded boys (there were very few girls) gathered on the ends of platforms in interesting places and exchanged stories. We had a common interest and talking was easy. The tales we told, no doubt, were rather like fisherman’s tales – ones that got away, or exploits in bunking sheds (to bunk a shed was to visit a steam engine depot without permission). Our aim was always a cop. A cop was a new train which we had not seen before. A cop could generate a bit of excitement if you were in home territory because most stock had a base and stuck in one area. I remember, for example, copping my last 2 Bil although I don’t now remember the number. Perhaps it had had a minor accident, for the Bils worked our area and a whole group of us needed the same one. One day, when on my own, I saw it. It was obviously fresh from the works, with its Southern Electric Green paint all bright and shiny. My friend would not believe I had seen it. They made special trips to find it, and, one by one, we all completed our 2 Bils. there were 150 of them! Train spotting also involved travel. It became a bit dull to stand at Three Bridges and watch the same old trains and get no cops. Journeying became essential. I had the very good fortune to have a father who did work at Wye College near Ashford in Kent, and at Southampton University near Eastleigh. Ashford and Eastleigh were where old and redundant steamers were scrapped. Both became places of pilgrimage for youngsters keen to see a particular loco before the cutters converted it to scrap metal. Eastleigh was the prime site and, fortunately, it was easy to bunk. One always started by getting to the end of the scrap stock sidings, as far from the shed manager’s office as possible and thus collected the numbers of engines destined for the torch. After that, one could risk the running shed, with a foreman who was keen to throw small boys off his patch. Knowledge and care meant that even if removed, and it happened, one had got all of the numbers that mattered. The station at Eastleigh was also a favourite. Eastleigh was quite a small railway town and the main expresses and boat trains didn’t stop. The local lads, in their Hampshire accents, always spoke of the fast trains as ‘flyers’. The Bullied designed steam engines were an awesome sight as they thundered through Eastleigh. Ashford was a much tougher nut for the train spotter. I never managed to bunk Ashford and had to content myself with taking train journeys towards Dover or Canterbury so that I passed the lines of locos awaiting scrap. They didn’t have the avid train spotter in mind at Ashford, for there were often wagons parked between the trains and the scrap lines. None the less, I got my last Schools class loco, number 30932, Blundells, as it stood in line waiting its turn to be broken up. I made frequent trips to the suburbs of London, too. It was cheap for a boy to travel. Clapham Junction, the busiest station in the world, might have seemed an ideal spotting station, but it was not. It was too spread out with so many trains one could not get all of the numbers. In any case, close on a quarter of the trains ran on through Three Bridges. We train spotters decided that Vauxhall or Wimbledon were better spots. Both were of a manageable size and none of the trains went down to Sussex. They were much enjoyed. As a train spotter one collected. Apart from numbers, I was keen to travel on as many lines as possible. However, I was realistic enough to know that I couldn’t do the whole country, but as far as Sussex was concerned I almost completed all possible lines that still had any kind of service. As far as I know, the only available line in Sussex which I missed was the Chichester to Lavant freight only line. Away from the Southern, I visited London termini, although often I went for one station out. Thus Royal Oak on the Metropolitan line and just outside Paddington became a regular haunt. I also took to Finsbury Park and Stratford out of Kings Cross and Liverpool Street respectively and both where the underground reached the surface. I was always a bit disappointed with the Northern lines out of Kings Cross, Euston and St Pancras. They had such sparse services. For me, used to my twenty trains an hour at Three Bridges, the lines to the North offered poor prospects to a train spotter. Mind you, the streamlined A4 pacifics were handsome engines and by going to a new area, I could guarantee getting cops. The diesel units which operated suburban services into North and West London were also a bit of a let down. Apart from being (in my eyes) of second rate design, they had no unit numbers. Individual carriages had numbers but these were hard to see and write down. I didn’t bother all that much with them. Holidays were, for me, train spotting opportunities. The first family holiday that I had out of Sussex was in Devon in 1961. A very kind father drove me and my brother Robin, for he spotted too, out to Wadebridge in Cornwall, so that we could cop the three ancient members of the 0298 class which operated the mineral line to Wenford Bridge. I believe my sister was pretty disgusted that we spotted trains on holiday, particularly on our first trip abroad to Germany in 1962. I can’t emphasise enough how important the railways were for me. The mere desire to cop numbers became something of an understanding of geography, geology, social history and economics. As a matter of social history, the railways were obviously regarded as safe. As a pre- teenager I travelled solo and widely. It didn’t occur to me that I might meet undesirable people. If my parents thought there might be risk, they kept it to themselves. And now we have a wheel that has turned full circle. The sectorisation of British Rail became full blown privatisation. My old stamping ground in Sussex is now the home of Connex South Central whilst in my current home I am within sound of Great West Trains whilst down at Salisbury I can get to Waterloo on South West Trains or to Bristol on Alphaline. There is no doubt that in some areas the service is much better than it was in the days of steam – but often not as good as 20 years ago. I fail to see the problem, though, with a corporate British Railways providing a good service for all rather than privatised train operators trying to make profits for shareholders. This was one of the first pages I created on the very first web site I set up in about 1997 or 8. At that time, I was merely proving to myself that I could do a web site. The photos need updating. They were taken on my first digital camera. It was an Olympus and brilliant – but at high resolution it managed 640 by 480 pixels. Memory cards were expensive, so mostly I took 320 by 240 pixel photos. I could add that the computer I used at the time had a 2gbyte hard disc so that had nothing to spare in the way of storage. It is hard to say why I took an interest in gramophones, although things clockwork and things simple mechanical feature in my life. So, too, did jumble sales, and it was from one of these that I came home with this device that had cost me 6d. That’s two and a half pence now. I was about twelve at the time. I remember my mother thinking that this strange item must be an old camera. She was amazed, as I was, when I set it up and got it going. 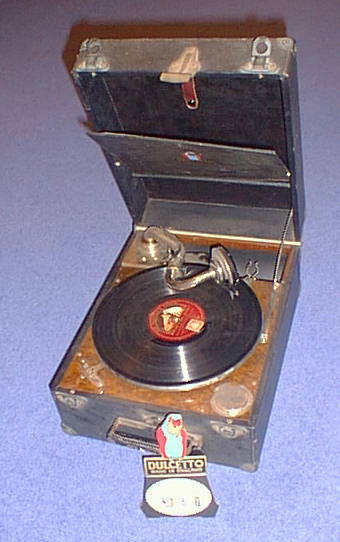 The only 78 RPM record I had at the time was (I believe) Arthur Askey singing ‘We’re going to hang out the Washing on the Siegfried Line’. Sad to say, I can no longer show that record for it got dropped and was gone. So here is that old ‘Peter Pan’ machine, working still. 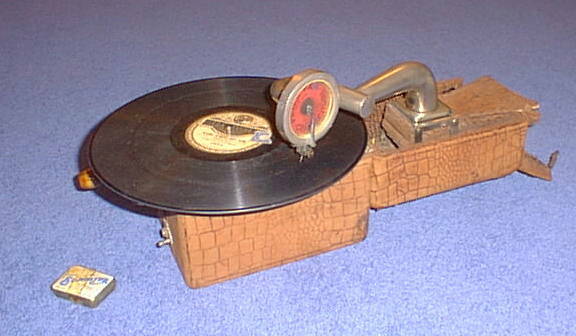 Peter Pan fold up gramophone. It is still very popular with older folk in my village. At one time, I was told that this machine was made for soldiers in the trenches of the first world war. I believe this is not true. Others have done more research than me and say they were made between 1922 and 1927. Peter Pan also made at some point an alarm clock which was incorporated into a similar style of gramophone. If anybody has such a device, I would love to actually see one. It was after I bought ‘Peter Pan’ that I decided that the pop music of 1960 or so was not for me. Why, I reasoned, spend 7/6 on a record when perfectly presentable 78s could be bought for a penny (1d) at jumble sales. I decided that I was keen on dance band music of the 1920s and 30s – a style of music which became all the rage the very next year when The Temperance Seven took ‘You’re Driving me Crazy’ to the top of the hit parade. The Peter Pan was and is a fine machine but it lacked loudness – even when used with Songster Extra Loud Needles. However, wind up gramophones were also consigned to sales and I soon had a collection. I particularly like this one, because inside it I found all of its original paper work. 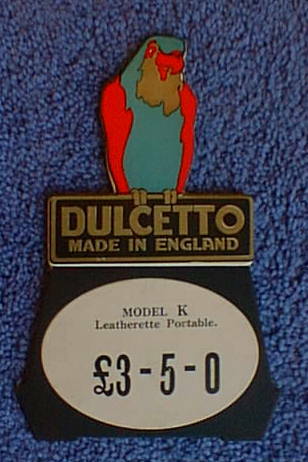 It is a Dulcetto and I like the fact that it is not a 78 player at all. Its speed indicator is set to 80. Columbia used a speed of 80 so I have always suspected a link with that company. In this case, I know everything I can about the machine. 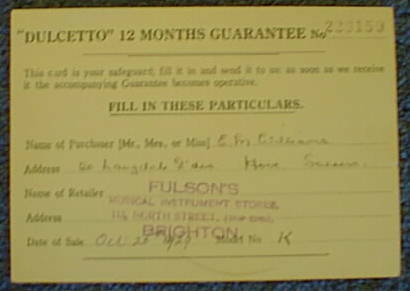 It was sold for £3-5-0 on October 26th 1929 by a shop called Fulson’s Musical Instrument Stores of 113, North Street (Top End) Brighton. The original purchaser was Miss E M Williams of 20 Langdale Gardens, Hove, Sussex. There could be more on this theme. Perhaps, after 15 years, it’s about time. I mentioned, whilst writing about a 2012 picnic at Horsted Keynes that I had been there in 1961 and had obtained old luggage labels from the mainline booking office. Let’s take a look at some of those old labels. This was a London Brighton and South Coast Railway label. Such labels measure about 1-cm by 5. They only show a destination which, I suppose, was all that really mattered. It meant a label like this could be kept at any parcels office on the L, B and S C R system, saving on the cost of needing different labels for different host stations. There was a big rack of these labels, all ready for the more common destinations. Less usual places that luggage was sent to would have been hand written. The old London, Brighton and South Coast Railway existed from the 1840s until the end of 1922. These labels were, at least, close on 40 years old when I got them. There’s a fair chance they are over 100 now. But there were other labels too, from the Horsted Keynes office. Here’s a special label to say, more or less, leave this package at the destination station. The railway company are not doing a delivery from there. This one specifies no company. Excess luggage sounds like a problem of the air travel age. And now a favourite. This one is more like 20 by 5 cm – which means it looks smaller! I love it! I hope the Bluebell Railway have such an item, for this came from what is now a station on their line. In 1923, the Government grouped the railways. 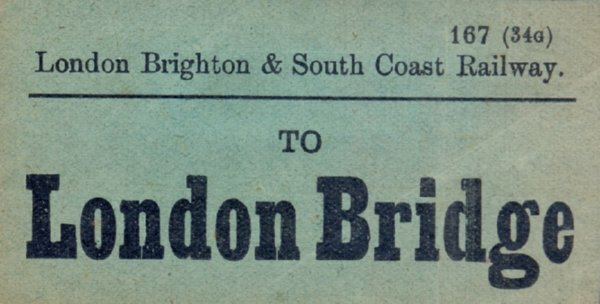 The London, Brighton and South Coast Railway was merged with its neighbours (and rivals) to form the Southern Railway. In the first instance, it made little difference to luggage labels. 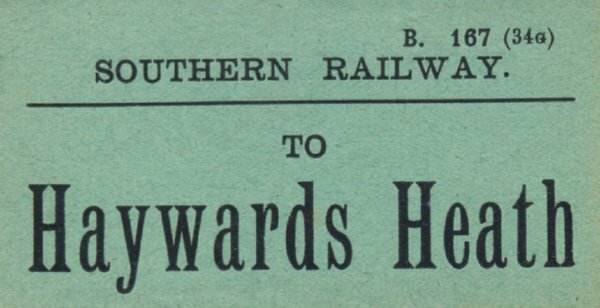 One assumes these, still on the old green L, B and S C R paper, were issued to Horsted Keynes soon after 1923 – for the Southern went to smaller white labels pretty quickly. These seem to have the same codes as the older ones. I’m going to guess the B. is for Brighton. These labels have no great value. Similar ones on Ebay have no takers, by and large. But value doesn’t matter. It’s what they mean to me that counts. How wonderful it is to be a sad, older nerd. Once upon a time I was a young nerd. Whenever possible, I saved tickets from days out. I can now look back 40 or 50 years and use the tickets to recall the old memories. Let’s start on 24th April 1966 and I could say it was a sad day for me for it was the day of the Pul/Pan Farewell rail tour. Let me explain why it was sad. A somewhat pompous friend once said to me – it was about music, ‘when people say they know what they like, they really mean that they like what they know’. He was probably right about music. After all, very few people would say they like opera but when Nessun Dorma was used as a football world cup theme, it became immensely popular and the three tenors became top celebrities. I’d say he was right, too, if we talk about train enthusiasts. I certainly liked what I knew. 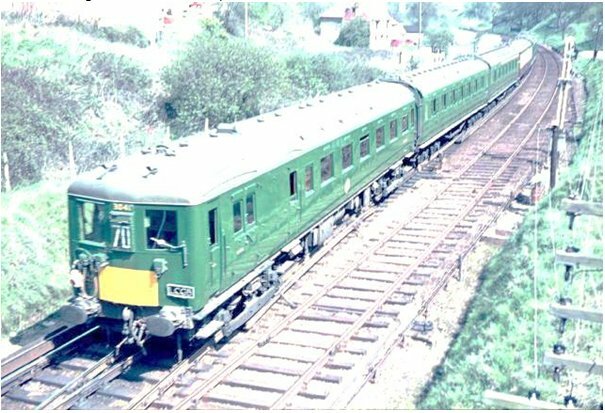 For me the ideal train was a green painted electric unit. Green that is, except for one coach which was a brown and cream Pullman car. For all of my life (OK, I was only 17 at the time) the fast trains in my area had been like that. I knew them and I loved them. But these trains were already at least 15 years old when I was born. At aged 34 and, no doubt, with well over a million miles under their wheels, they were worn out and being replaced by new trains which, to my eyes, were not as smart and didn’t have the Pullman car. 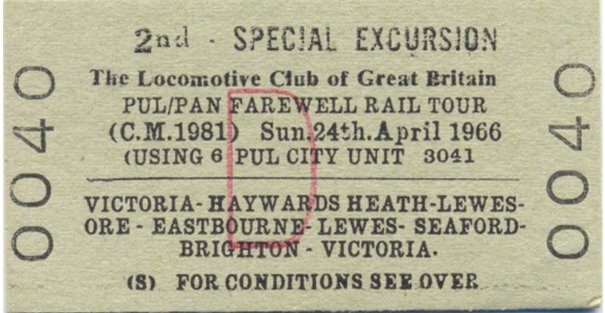 The Locomotive Club of Great Britain probably took a gamble organising this tour. Electric units were generally considered soulless and most enthusiasts weren’t that bothered about them. But they went ahead and organised a trip to mark the end of the line for these units. The unit chosen, number 3041 was actually a one off. It had a slightly different shaped front elevation from all the other similar trains. Most people would never have noticed but those of us in the know could spot this particular unit a mile off. So this day really marked the end of my favourite trains. None were saved for preservation although many of the Pullman cars do still exist. For me it was the demise of old friends and the day out was a requiem for them. I was not alone for my friends Bob Moore(who actually preferred the 4Cor units which I thought were much inferior) and Nick Hall were with me. It was a grand day travelling lines all of which were very familiar to me. From Victoria in London we’d have passed through a station which was probably then known by the rather long name of Three Bridges for East Crawley then it would have been the three Balcombes – tunnel, station and viaduct over the ouse before Haywards Heath. At Keymer junction we’d have forked left for the journey to Lewes and then there’d have been a favourite stretch of four miles from Lewes on to Glynde. This Was favourite, because it was the stretch we could see from our annual camp on Beddingham Hill. The passing trains, about a mile away were very regular in their activities. We could set our watches by them. The train then went back the way it had come, but this time took in Eastbourne and an extra reverse before reaching Lewes. Here we reversed again turning right at Southerham for New HAVen and SeaFORD. Capitals emphasise the way the locals say those names. Then it was a reverse again, to Lewes and Brighton for a non-stop, 60mph run to Victoria – 50 minutes. There’s plenty I don’t remember from 46 years ago but I do remember having a very enjoyable day.